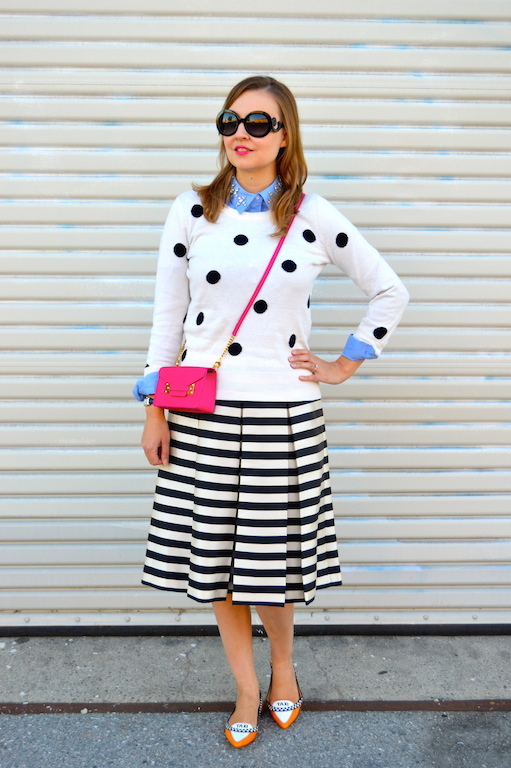 Stripes and polka dots are probably my two favorite patterns, aesthetically speaking. Somehow, just adding something with bold stripes or playful polka dots instantly makes any outfit playful, fun, quirky, and yet still stylish. It's a win-win situation. With this outfit I decided to add these two elements together into one cohesive ensemble for twice the impact. As if the outfit wasn't quirky and playful enough, I also opted for one of my favorite pairs of shoes, which are these taxi flats. As you probably already know, I am a big fan of purses and shoes that look like things or animals, so these are right up my alley. I think I would wear them more often, but my students once Googled them and told me how much they cost the day after I wore them years ago, so I've decided to refrain from wearing some of my quirkier pieces to work that can be easily Googled by my nosy students! Since the outfit is black and white, I thought in addition to the yellow pop of color that my shoes provide, I would also add a pop of pink in the form of my new micro mini bag from Sophie Hulme. At first I was a little bit reluctant about wearing such a small bag, as I wrote about in a previous post, but now I am finding it quite liberating to carry around just the bare necessities. Below I have put together a few outfits that are reminiscent of the black and white ensemble I am sporing today. 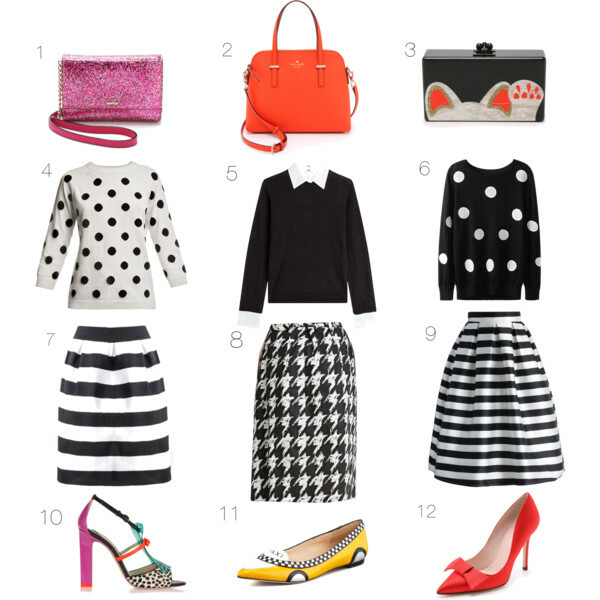 As you can see, although the sweater and skirts are all in black and white, the accessories are playful and colorful for an added "wow" factor. 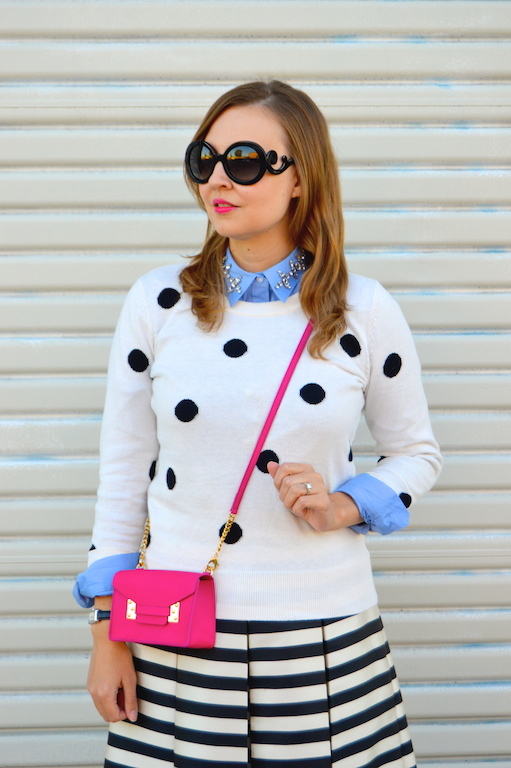 I love the strips & the polka dots together! And the shoes are simply the best! This outfit is happy, bright, sophisticated and beautiful just like you. I adore your shoes and bag. Your kids are so lucky to have such a fashionista teacher. What do you teach Katie? Wishing you and your hubby a very wonderful Thanksgiving!